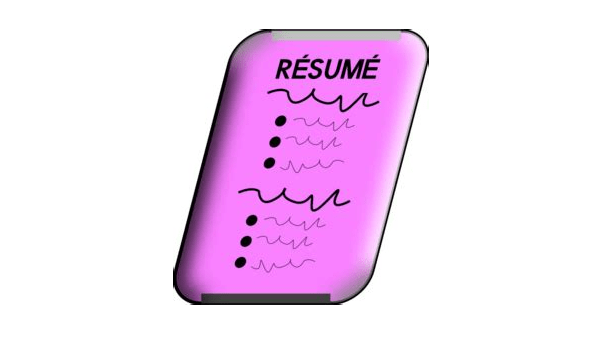 A resume is a one-page document that provides an overview of your experience, skills, and other relevant information. Since the primary goal of a resume is to sell your abilities to a hiring manager, making a resume is your first step toward finding a job. Resumes give employers a way to learn about applicants quickly and easily, so they can screen out job seekers who don’t have the right experience or qualifications. Before getting started on your first resume, you will want to analyze your target jobs, see what types of employees they are looking for, and see where you fit. You want to show how you’re a perfect candidate for the job(s) that you are applying for. 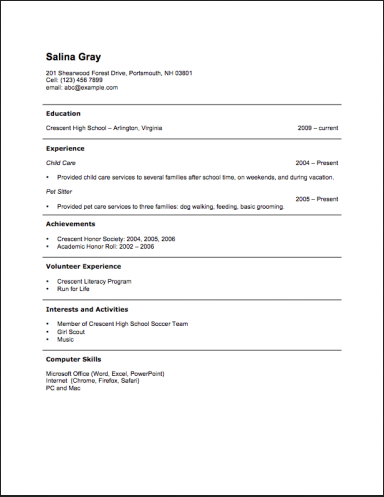 A well-crafted resume that highlights your experience will set you apart from the competition. Start by putting your name, e-mail address, and phone number at the top of the page. Make sure your e-mail address is professional-looking. It’s best to use one that includes your first and last names, not a nickname or other reference. A career advisor recently told me DON’T include my home address, which surprised me, but it makes sense. In the past, a mailing address used to be necessary for companies to send you a letter. Now most contact is done by phone or e-mail. Also, recruiters are in a hurry to look for every possible reason to put your resume in the “no” pile, and where you live can be one of them. Besides, in this day and age it’s probably not a good idea to put your address on the resume for privacy/security reasons anyway. If you have a professional profile on LinkedIn, you can include the link at the top of your resume. List the jobs you have had in chronological order, beginning with your most recent. There are other types of resumes, but it’s been my experience that hiring managers always prefer the chronological one. They specifically want to see job titles, company names, and dates employed (from month/year to month/year or present). For high school and college students, a long job history is not necessary for a strong resume. Instead, you can emphasize the skills and knowledge you’ve developed in your studies, internships, community service, or part-time work. So it’s fine to include volunteering, babysitting, tutoring, odd jobs, summer jobs, temporary jobs, and internships if you don’t have much in the way of real work history yet. If you have a blog or otherwise publish online content that is relevant to a position of interest, you can list this too. Anything to make it look like you’ve been busy and not just goofing off! Include any other pertinent information and accomplishments from home, school, or community such as high school graduation date (or expected graduation date), test scores, relevant coursework, non-credit courses taken (including MOOCs), academic honors, special projects, leadership roles, extracurricular activities, hobbies, clubs, athletics, scouting, community service awards, scholarships, certificates, books or articles published, college enrollment status, major, etc. Alternately, if you seek a job in academia, an academic resume known as a CV (curriculum vitae) lists all the details related to your educational background. This would include papers, publications, and presentations as well as academic honors and awards, degrees, research/field work, teaching/tutoring experience, membership affiliations, etc. Identify the particular skills and competencies that you have, which potential employers are seeking. You can list these in a column called “Skills.” What are some key skills you might list? Make sure these skills aren’t just drawn out of a hat but correspond to your actual work history, volunteer experience, school and extracurricular activities. There should be at least one example in your experience that backs up each skill. Write a keyword-rich summary section with 1-3 sentences emphasizing the experiences and accomplishments that best define you. Ideally, these will match the key qualifications and skills that appear in the description of the job you are applying for. Even if your work history has nothing to do with the job you’re applying for, you can still highlight those skills and experiences that are relevant to the job you want. Your resume should be formal, professional, and relevant. Don’t be concerned if it looks too short; just make sure it’s neat and accurate. Some people and websites will give different advice, but basically you should avoid fancy formatting, use a simple font in size 10-12, left-justify everything, and leave plenty of white space so that your resume is easy to read. Even if you have little or no work experience yet, these guidelines will get you on track to having a great resume and all the opportunities that come with it.